Where's Councillor Dickinson Living Now? Topic: Where's Councillor Dickinson Living Now? I understand Cllr Dickinson moved out of his Eastcott home some time ago, and I've been patiently waiting for his contact details on the SBC website to be updated accordingly. During his 2007 election campaign Cllr Dickinson and at least one of his canvassers led voters in Freshbrook and Grangepark to believe he would be moving into the ward so I was a bit surprised when an estate agent pal of mine thought Cllr Dickinson was the same chap he'd shown round a house in Walcot. So, where do I send his 'Welcome to your new home' card? Re: Where's Councillor Dickinson Living Now? While we're waiting for info on Tricky Dickies domestic whereabouts, let's have another look at the 2007 LibDem 'X' Factor leaflet which was distributed throughout Freshbrook & Grangepark. The LibDems called Michael an 'A Tory from Old Town' who 'Lives miles away'. I'm just interested to learn whether Michael will become known as the 'Invisible Man of Freshbrook', 'Walcot Wanderer' or can now, at long last, properly claim to be a 'local' councillor. Muggins: The estate agents comment was quite innocent, very much along the lines of, (after seeing a picture I was working with), "Hey, that looks like a guy I showed round a house in Walcot". When I last enquired a couple of weeks back I think he was still one of my residents. Not sure what's happened since though. Anyone got an up to date copy of the electorial register? And he still is one of your residents Dave, but only just. Lamplighters Heinrich and L'Espion Turc report that they have watched Michael regularly perambulate past their windows over the last couple of weeks leading to speculation that he had indeed moved in the opposite direction from Freshbrook and Grange Park and moved into Walcot. Will correspondents tapping on the door of number 113 hoping to have a quick word with Tricky Mick find him in residence? Even the leader of the Council publishes his address without a 'Post To:', in fact I've looked at a few other councillors and note that Michael seems to be the only one doing this. So, I'll ask again: Where is my Councillor Living? Perhaps you could put in an FOI request Geoff!!! Remember that Charlie Drake thing, "Where is Sylvia". It could be quite a routine: where is Michael? Why post? It is a good question, but it's not care of Groundwell Road, so it's more than likely it is possibly his address unless he has moved out of Swindon? 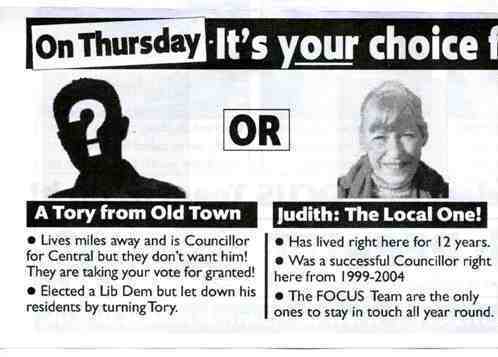 The LibDem leaflet of the X Factor is true of a Tory from Old Town and appears to remain almost true to this day? ( Is Groundwell road Old Town?) Did the rear of the leaflet have other X factor information on it, or is it a sort of pirate map and X marks the spot of where to find the buried treasure? I do not think there is a problem with where your councillor resides as long as it is within Swindon. Where the problem occurs is when some politicians indicate that they will move into their ward/constituency when elected. I have never told anyone I would move into my ward, but who knows as there are a lot of bungalows in the ward and I am not getting any younger. The old apples and pears appear a bit steeper to me these days.